Ralf Bendrath: Who Controls the "Dog" that You are Online? Who Controls the "Dog" that You are Online? Slate has published a nice and polemical column by Michael Kinsley about how the public display of peoples' lives on the internet has changed in the last ten years. 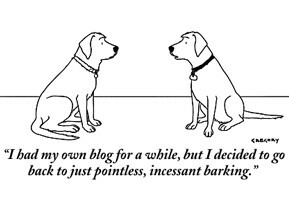 He reminds us of the famous cartoon by Peter Steiner "On the Internet, nobody knows you're a dog", first published in The New Yorker in July 1993. Nowadays, it seems that everybody wants everybody else to know not only that they're a dog, but also which kind of dog, where they live, which dogfood they like, and who their dog buddies are. It started already in Web1.0, but social platforms like Myspace or Facebook on the one hand, and free blogging services like this one here have made it much easier for everybody to publish online without having to know HTML codes or how to use an FTP server. And of course, publishing includes publishing things about themselves. This is a common theme among the people who think about what privacy and anonymity used to be, and it is not limited to the internet. But Kinsley and a lot of others always miss three important points. First, the problem is not that people publish information about themselves. This is free speech, and I would always fight for everybody's right to be able to do it. But that does not mean that I also want to have to do it myself. The privacy problems do not lie in the fact that people become more outspoken about themselves (which is just one side-effect of the current neoliberal model of society, where everybody is his own entrepreneur), but in the extent to which people are forced to publish about themselves - socially, legally or economically. Second, what the online community still has to learn is the fact that just because something is online somewhere about someone else, it is not automatically appropriate to tell everybody else everywhere about this. This is what Helen Nissenbaum has called "contextual integrity": My buddies at Myspace meet me there in my private role, where things that are relevant and expected are much different from what my boss should see if he's looking for my professional online behaviour, eg at our institute's website. Different information about people is relevant and should be used in different contexts. In the old times, people called it politeness and discretion, and it included the fact that gossiping was highly regulated through social norms. We still have to learn how to use information about others in an appropriate way in the new online contexts - even if it is theoretically out there for all the world to see. Third, all this relates to what people publish about themselves. It's a totally different thing if I publish information about myself, or if others collect, store, transfer, and use information about me. In the latter case, I have much less control over it (even under strong European data protection law). Even more important, some data that is collected is much more detailed than I would ever publish or even write down for myself. Cookies, referrers and other technologies allow others to track which websites I visit, how long I read them, where I go next, which ads I click and so on. This is the shift from transactional data in the offline world (e.g. credit card bills when I go shopping) to behavioural data that now is produced in the online world (how often I return to a website, when I read a specific blog etc.). So it's both the amount of data and the information it reveals that is becoming much bigger, and it's the ability of companies to collect this even without my knowledge. This is where the real transformation of and threat to privacy through the internet lies. remember the paris hilton syndrome mentioned in athens?